WP blog manager Lite will save your time (hours and days to design a WordPress website), and get your WordPress website ready in just few minutes. 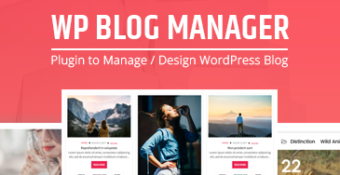 Create your categories, posts and select from the design layout library from WP Blog Manager Lite Plugin – your archive page and blog detail page will be all ready with beautiful designs to go live! No coding skill needed at all. * Create unlimited number of blog. * Add unlimited blog design in single page or post or template. * Show post from all possible taxonomies or categories. * Sort retrieved posts from order and orderby parameters. * 7 different templates to show the blogs in different styles. * 3 pre designed beautiful,responsive grid templates ready to use. * Full controls of columns in desktop,mobile or tablet in grid layouts. * 2 pre designed list templates. * 2 pre designed slider template. * Full control on transition speed, pager,autoplay,controls and many other settings of slider layout. * Enable/Disable the metadata of posts i.e categories,tags,author, comment count and date. * Manage four different image size for post. * Manage the number of post to show in frontend. * Easy usage via Shortcode. Hey Buddy!, I found this information for you: "Plugin to Manage / Design WordPress Blog – WP Blog Manager Lite". Here is the website link: https://access-keys.com/wordpress-plugins/wp-blog-manager-lite/. Thank you.